If you have been contemplating a healthcare or nursing career, or looking to advance your current healthcare career, now is the perfect time. A shortage of nurses was predicted in 2012, with about 1 million new nursing positions opening by 2020. Currently, there are more than 3 million registered nurses currently employed and while the number is growing, there will not be enough trained nurses to meet future demands. With 700,000 nurses expected to retire by 2024, and the Baby Boomer population aging, the nurse industry will be in a boom. It also helps that, according to the Bureau of Labor Statistics, nurses in 2012 made about $65,400 on average. But RNs are not the only job that will see openings. With nearly 600,000 nursing assistant openings and licensed practical and licensed vocational nurses with more than 360,000 combined openings by 2020, the healthcare industry is an excellent choice for a career. Let’s look at other healthcare jobs, especially those for nurses looking for an upgrade, with openings and salaries any jobseeker will find desirable. With a nurse salary median of about $100,000, the nurse practitioner job – an Advanced Practice Registered Nurse position – is definitely a career upgrade from a registered nurse. However, with greater salary comes greater responsibility. Depending on state regulations, performing physical examinations, running and analyzing diagnostic tests including lab work and x-rays, prescribing medication, and providing proper disease prevention are just some of the duties assigned to a nurse practitioner. They have more autonomy than a typical registered nurse, but are still often part of a healthcare team. In 20 states, nurse practitioners do not require supervision; in all others, physicians must at least sign off on patient care choices. Nurse practitioners are able to take on about 80 to 90% of a physician’s duties. A nurse practitioner must already be a registered nurse, and must have a Master’s degree in an area of specialty. A state license and certification are both required. Not far behind the nurse practitioner is the midwife, earning a median salary of $96,000 last year. Much like the nurse practitioner, a midwife – well known for delivering babies – has a high level of autonomy, often working with outpatients or performing home births, though the majority can be found in hospitals. They provide both pre- and post-natal care for the mother and helping with care of a newborn. However, they also provide whole-life care to women, including performing physical exams, ordering diagnostic tests, prescribing medication and contraception counseling, and gynecological care. Much like nurses, midwives have seen growth in the job market, projected at 31% by 2022. This is especially thanks to the 2010 Affordable Care Act expanding Medicaid coverage to midwives, with reimbursement rates nearly equal to physicians. The University of Cincinnati also points to the meteoric rise in Cesarian section births. C-Sections accounted for a third of births in 2012, up from a mere 5% in 1965. The university noted that women want “maternity care that supports their own ability to give birth naturally.” Midwives now deliver 1-in-8 vaginal births, and in the state of New Mexico, deliver nearly a quarter of all births. Requirements for becoming a midwife include a Bachelor’s Degree and certification from the American College of Nurse-Midwives. For acceptance into a training program, a Registered Nurse license may be accepted in lieu of a Bachelor’s degree. The training program will also provide an accelerated way to obtain a Bachelor’s of Science in Nursing, fulfilling the degree requirement for certification. A year of clinical experience focusing on maternal/child nursing is highly recommended. Though the nurse anesthetist has a higher earning potential, with an average salary of $158,000, growth potential in the industry is 19% through 2024, lower than other higher-education nursing options, but still significant. Often working alongside surgeons, dentists, podiatrists, and anesthesiologists, Certified Registered Nurse Anesthetists (CRNAs) can be found anywhere anesthesia is administered. They have a high level of responsibility, resulting in a high salary. Though men make up only 8% of nurses, nearly 45% of CRNAs are male. CRNAs are the sole provider of anesthesia in two-thirds of rural hospitals, and in some states, are the only providers for rural hospitals that lack anesthesiologists. An RN can become a CRNA after completing at least one year of critical care experience and earning a Master’s Degree from an accredited nurse anesthesia program. Finally, an healthcare option that does not involve working directly with patients, but will benefit from hands-on experience. With a median salary of $94,500 and a growth rate of 17 percent through 2024 – more accelerated than the average job position – the position of healthcare administrator or manager is a promising career. Healthcare administrators are directly responsible for setting policies in hospitals, health systems, pharmaceutical companies, nursing homes, and more. They work in public and private healthcare sectors, in the federal government and physician private practices. Aside from shaping policies in their organization, they manage health care facilities, services, and programs, oversee staff, develop budgets, and handle relations with other health care organizations. Healthcare administrators face ethical dilemmas regularly, from balancing a budget while factoring in quality of care, to mitigating legal risks for their organization and more. While not interacting with patients on a day-to-day basis, they still shoulder a large amount of responsibility – and still greatly affect the lives of patients. Professionalism and leadership skills are a must, and in-depth knowledge and experience in the healthcare industry – such as being an experienced RN – is highly advantageous. Lower management positions require a Bachelor’s in Healthcare Administration or closely related field, though advancement may be limited. A Master’s degree or doctorate may be required for higher levels of management, as well as experience in the healthcare field, especially in administration. 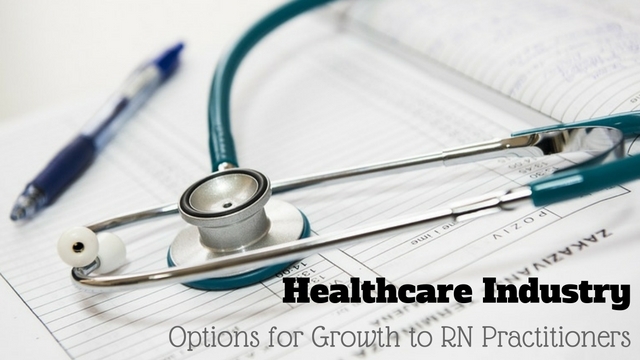 Between Advanced Practice Registered Nurse positions and healthcare administration, the healthcare industry growth is heading high into a period of growth. With the Baby Boomer generation creating the largest number of seniors the United States has seen, nurses and beyond will be in high demand. Next articleHR Policies and Procedures: Why are they So Important?